Looptate Games - Welcome to MathFourOps Games! The 4 arithmetic operations: +, -, *, /, are used very often in our daily lives. In many places, machines do the calculations for us and people forget how important it is to master the operations ourselves. Machines might not make mistakes but humans do. For example, if a shop forgets to update the sale price, you might pay the higher price without noticing unless you have mastered the 4 arithmetic operations. 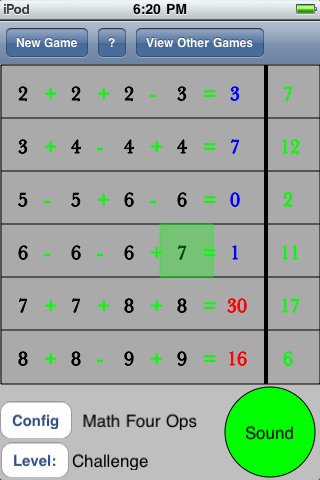 MathForOps is a game to practice these four arithmetic operations. It has 4 fun and challenging levels. Beginner: work with two expressions, each involving four numbers. Intermediate: work with three expressions, each involving four numbers. Advanced: work with four expressions, each involving four numbers. Challenge: work with six expressions, each involving four numbers. The player can choose if parentheses are involved. The player can play with any one of the following combinations of operators. The object of the game is to swap the numbers to make the expressions equal to the target results. The player needs to do some logic analysis to decide which numbers to swap. The player will choose a suitable level to start with, Figure 1. 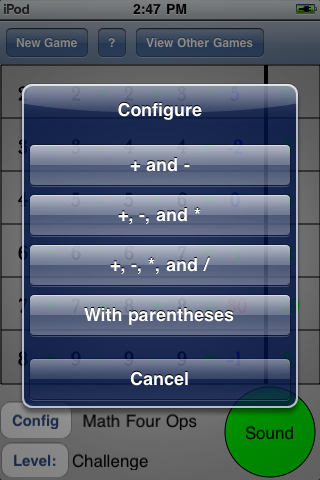 Next, the player will decide if the parentheses are needed by the fourth button in the Configure window, Figure 2. The player will use the first three buttons in the Configure window, Figure 2, to decide what kind of operations to practice with. In each round, the player needs to choose the first number. In Figure 3, the number 7 is chosen and the number 7 is highlighted with the light green color. In Figure 4, the player chooses the number 9 in row 6 and column 4 to swap with 7. The player could view the solution by pressing the Solution button in the Help (?) window. Figure 6 is a solution screen.